COX'S BAZAR (Bangladesh) • More than 2,600 houses have been burned down in Rohingya-majority areas of Myanmar's north-west in the last week, with United Nations chief Antonio Guterres warning of a looming humanitarian catastrophe and Turkish President Recep Tayyip Erdogan accusing Myanmar of "genocide" against the Muslim minority group. The United States has also urged Myanmar's military to protect civilians. About 58,600 Rohingya have fled into neighbouring Bangladesh from Myanmar, according to UN refugee agency UNHCR, following one of the deadliest bouts of violence involving the minority in decades. The World Food Programme, meanwhile, said it has suspended food aid in Rakhine state as the humanitarian situation has deteriorated with a surging death toll and tens of thousands - both Rohingya Muslims and ethnic Buddhists - on the move. Number of Rohingya who have fled into neighbouring Bangladesh from Myanmar. Number of people killed by the clashes and army crackdown. Number of "ethnic residents" who have been evacuated from the area. The treatment of Myanmar's roughly 1.1 million Rohingya is the biggest challenge facing leader Aung San Suu Kyi, accused by Western critics of not speaking out for the Muslim minority that has long complained of persecution. 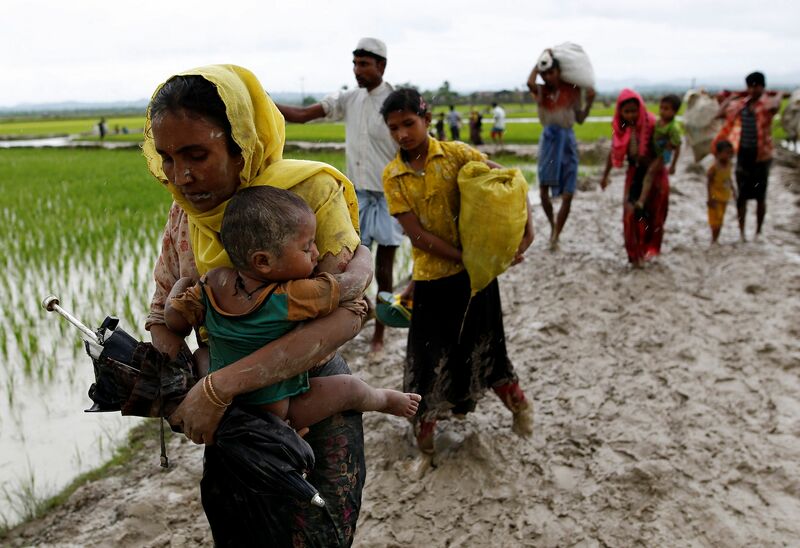 The clashes and army crackdown have killed nearly 400 people and more than 11,700 "ethnic residents" have been evacuated from the area, the government said, referring to the non-Muslim residents. "A total of 2,625 houses from Kotankauk, Myinlut and Kyikanpyin villages and two wards in Maungtaw were burned down by the Arsa extremist terrorists," the state-run Global New Light of Myanmar said. The government has declared Arsa a terrorist organisation. But Human Rights Watch, which analysed satellite imagery and accounts from Rohingya fleeing to Bangladesh, said the Myanmar security forces deliberately set the fires. "New satellite imagery shows the total destruction of a Muslim village, and prompts serious concerns that the level of devastation in northern Rakhine state may be far worse than originally thought," said the group's deputy Asia director, Mr Phil Robertson. Near the Naf river separating Myanmar and Bangladesh, new arrivals in Bangladesh set up crude tents or tried to squeeze into available shelters or homes of locals. The Rohingya are denied citizenship in Myanmar and regarded as illegal immigrants, despite claiming roots that date back centuries. Bangladesh is also growing increasingly hostile to Rohingya, more than 400,000 of whom live in the poor South Asian country. Mr Guterres said it was the government's responsibility to provide security and allow aid agencies to reach those in need. Said Mr Erdogan yesterday: "Those who close their eyes to this genocide perpetuated under the cover of democracy are its collaborators." Singapore's Ministry of Foreign Affairs yesterday issued an advisory on non-essential travel to parts of northern Rakhine state. It said while tourist sites in Rakhine were unaffected, the "security situation can deteriorate quickly". About 58,600 Rohingya from north-west Myanmar like these ones have fled into neighbouring Bangladesh as more than 2,600 houses were set alight. United Nations chief Antonio Guterres has warned of a looming humanitarian catastrophe while Turkish President Recep Tayyip Erdogan accused Myanmar of "genocide" against the Muslim minority. The deteriorating humanitarian situation has forced the World Food Programme to suspend its food aid in Rakhine state. Myanmar officials blamed the Arakan Rohingya Salvation Army for the burning of the homes. But Rohingya fleeing to Bangladesh say a campaign of arson and killings by the Myanmar army is aimed at trying to force them out.